You’ve done everything right. Your propane powered forklift is well-maintained, and stored properly overnight. Still, it happens: you’ve turned the key or pushed the button and…nothing. It will not start. There’s little that can kill a morning faster, particularly when you think about having to call a service technician to come out and have a look. If the service call results in a diagnosis of the problem as something simple, you’ll feel even worse. That’s why we’ve written up this quick set of instructions on what to try before calling in help. If you’ve had training to inspect and maintain your vehicle, save yourself time by trying the following. If your propane powered forklift cranks but will not start, especially after replacing the LP tank, check for a “Double O-ring” in the hose connection that screws into the propane tank. There is a sealing O-ring which belongs in the tank fitting. Oftentimes, the O-ring gets stuck in the forklift hose connection. If this happens, the hose connection cannot properly screw down and seal on the tank, which means fuel will not be able to flow to the engine. Visually look at forklift side of the hose connection as shown in the top image. 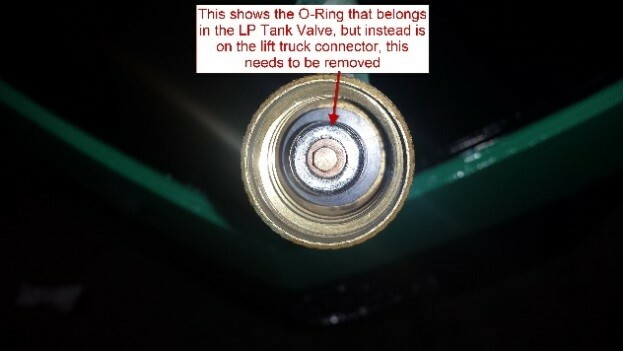 If you see an O-ring stuck down inside, you will need to remove it, place back into the LP tank as shown in the second image, to achieve the proper connection and allow the fuel to flow. Atlantic Lift Truck exists to move America’s commerce, one customer at a time. An authorized Caterpillar, Mitsubishis forklift dealer with complete sales, leasing, rental, parts and service capabilities, Atlantic Lift Truck services the mid-Atlantic territory of Maryland, Northern Virginia, District of Columbia, West Virginia and Delaware. We deliver quality leading innovative products and highly integrated solutions that provide the best quality return on investment to our customers. To learn more, visit atlanticlift.com.